UPPSC Prelims 2017-18 Online Result Declared Now : Check Here Your Result for Preliminary examination now. UPPSC Prelims 2017 Result-Public Service Commission, Allahabad has Finally released the Online result of UPPSC Prelims 2017-18 Examination. UPPSC, Allahabad has released Online list of shortlisted candidates for UPPSC Mains examination. Approx 2.5 lakhs+ candidates appeared in UPPSC Preliminary Examinations. Click Here to Download PDF of LIST OF CANDIDATES QUALIFIED. How to Check UPPSC Prelims 2017 Result? 2. Find LIST OF CANDIDATES QUALIFIED FOR COMBINED STATE/UPPER SUBORDINATE SERVICES (MAIN) EXAM-2017. 3. 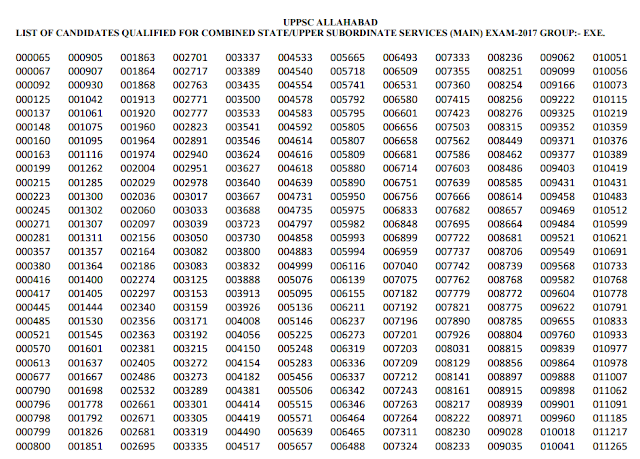 Click on that to download UPPSC Prelims 2017 Result PDF. 4. Match your Roll Number in the PDF. All the best for UPPSC Prelims examination.